the Cultural Revolution sold for HK$8,970,000 (US$1.1m) — an all-time record for a Chinese stamp or multiple. 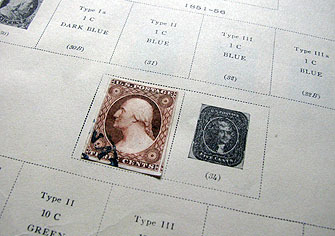 Including a 15 per cent buyer’s fee, the anonymous buyer paid over US$1.3m for the stamps. This reminds me of something totally unrelated to Ryan’s point, namely that it’s surprising how inexpensive lots of old stamps are. A couple of weeks ago I noticed a dusty stamp album sitting in one of my bookshelves and realized that I’d never actually opened it up. I don’t know where it came from, but it’s dated 1940 and I assume it must have been my father’s. Anyway, I took a look inside, and on the very first page there was a stamp from 1851. This was part of the second series of stamps ever released in the United States — issued before the perforated stamp revolution of 1857 — and you’d think it might be worth something, even in used condition. But no. According to this site, it’s worth at most either $70 or $7 depending on whether it’s orange-brown or dull red. What do you think? Looks like orange-brown to me, which makes it worth $70. Maybe. Cheap! And that’s for one of the earliest stamps ever issued in America. I guess stamp collecting must be a pretty accessible hobby — though they make up for the low prices with a fantastic array of varieties and special issues. Still, a bargain compared to coin collecting.